Click on this link > The Big R Fly Shop Bug Blog. This was a fun sharing of some experiences that I have had in fishing for these wonderful wild trout here. I hope you enjoy the read. Below is a picture of the old wooden lapstrake Swampscott Dory that I restored over a few years of time. I enjoy rowing this boat around here, and I fish from it a little too. On the home front, we have had mostly mild, sunny weather here during the days and dry, freezing cold temperatures at night for over eleven straight days. The beaches have been very fish-able most days as we have had very little wind, and the winter tides have been good. We are in a near-record dry spell for this time of year. And so too our regional river flows have drawn down to perfect fly fishing conditions. A happy little stint of mid winter fly fisherman's luck. And even though it is wild winter steelhead season here now, I do enjoy putting together a little pack, with a thermos of coffee, a sandwich and piece of fruit, and maybe a good book, and just wandering the beaches, casting a fly. During the mid day hours now, even though the previous nights are bitterly freezing cold, the beaches gain a lot of heat from the sun; the mudflats and shallows heat up, the gravels get warm, and sometimes the drift wood and logs will even emit a bit of steam as they gain heat from the sun. And as the tide water rises at the edges of things, the water too gains a little heat along the way. On these days every kind of shore bird, sea duck, heron etc., that these waters host, will be feeding in the shallow estuaries, lagoons, shorelines and edges. And often we can find sea run Cutthroat Trout in that situation, feeding right along with the birds, on the small marine life that thrives there. Everything follows the sun. Winter Cutthroat beach fishing is a slow, easy pace. Contemplative, relaxed, and sometimes very rewarding. This is not the same work as a committed steelhead trip in harsh winter conditions. And often I just wear warm clothing and a pair of knee high boots. I use smaller flies at times; shrimp, amphipod, squid, very small sandlance patterns, soft hackles, and even the Chum Baby. And I have great faith in Leland Miyawaki's Beach Popper. After a while I will take a break, sitting up against a log in the sun, enjoying some hot coffee and lunch, maybe a cigar. 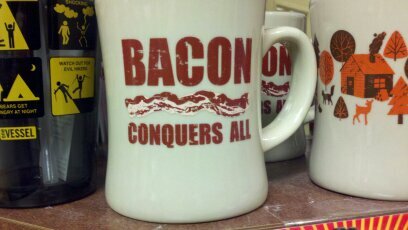 And even a good book. It's supposed to be fun. And we catch a few. With the rivers in such good shape now, and the weather being so fair, and bound to be so for nearly another week, my focus has been shifted back to our rivers and wild winter steelhead . But it kind of nags at me sometimes, on the nice days like this, when I know that there are probably some good trout working at the edges of a tide somewhere. 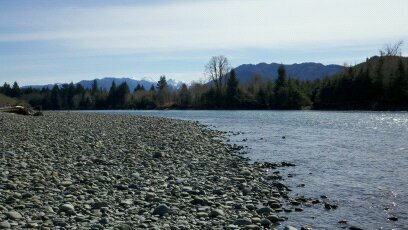 I am confident that the winter months ahead will afford a few more opportunities to fish on my beaches; after the warm Pacific storm driven rains cycle through the Olympic Mountains again, melting the snows, raising the rivers with silt and mud laden torrents. Low water steelheading, on sunny winter days, means that there is a need for quiet approaches, stealth, and lighter presentations. The water may be gin clear. 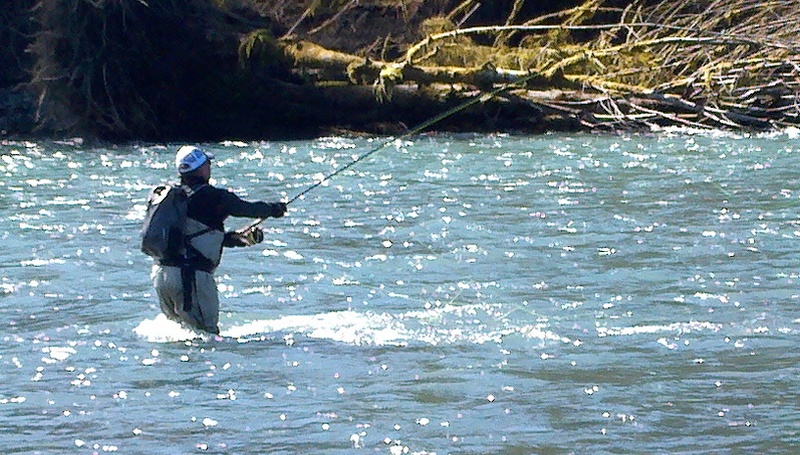 These Olympic Peninsula wild winter steelhead are known to be very good at hiding in these conditions. And so we can expect that they might burrow into things; hugging the deeper bottom structures and gravels, hanging along submerged debris and logs and rocks, resting beneath foamy whitewater, and hiding in the shadows along the edges. And once in a while you can walk up to a run and find one, perhaps a perfectly camouflaged, chrome bright, ocean fresh beauty- lying right there in the open, smack in the middle of a shallow fast run, almost invisible. I can assure you that fishermen walk and row right past these fish every day here. The regional forecast looks good here for the next three to four days, with freezing levels generally remaining at lower altitudes, and returning warmer moisture, rain etc., on the radar by early to middle of next week. And that could be very good for bringing up the rivers a little bit, and moving some fish upriver. It looks like we will have rain much of mid to late week coming up, but the mountains are freezing at low altitudes too, so it could be just right. And we could be able to fish every day through that nice cold, wet winter weather. Of course we won't know for sure until it happens. The freezing temperatures at night will cause black ice and freezing fog in many places. So be careful driving in the colder hours. The roads are always freezing before the thermometer in your car indicates. I think that the rivers will only run lower through this brief period. So why not try some lighter, quieter casts, less wading, working smaller and slower. Try to get onto the water at dawn. Or begin your day late in the morning, and focus on the afternoon and sunset hours. Generally lower light conditions can help fish to move with confidence. And watch where you step, because you just might bump into the fish of a lifetime, right there at your feet. I will be guiding winter steelhead fly fishermen all winter and spring. And between winter storms, when the rivers are running high, and the sun is shining, I will be out on the beaches chasing sea run Cutthroat. These are all walk and wade, catch & release, fair chase, fly fishing only trips. We don't use indicators, jigs, nymphs or floats. We fish with a single barbless hook fly only, wet fly swing. We take a few breaks, have a nice lunch, and enjoy the day as we cover a lot of good water thoroughly, sometimes on more than one river. If you want to come fishing with me you will need to plan well ahead. Feel free to call, and always leave a message if I do not answer, or drop me an email. I usually return messages within a day, or two at most.